*Now a major Sky original production*THE NUMBER ONE INTERNATIONAL AND SUNDAY TIMES BESTSELLER. 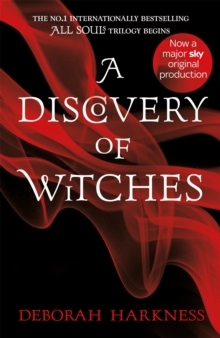 A Discovery of Witches is the first in the must-have, must-read ALL SOULS trilogy. It begins with absence and desire. It begins with blood and fear. It begins with a discovery of witches. Fall under the spell of Diana and Matthew in the stunning first volume of the No.1 internationally bestselling ALL SOULS trilogy. A world of witches, daemons and vampires. A manuscript which holds the secrets of their past and the key to their future. Diana and Matthew - the forbidden love at the heart of it. When historian Diana Bishop opens an alchemical manuscript in the Bodleian Library, it's an unwelcome intrusion of magic into her carefully ordered life. Though Diana is a witch of impeccable lineage, the violent death of her parents while she was still a child convinced her that human fear is more potent than any witchcraft. Now Diana has unwittingly exposed herself to a world she's kept at bay for years; one of powerful witches, creative, destructive daemons and long-lived vampires. Diana is inexplicably drawn to Matthew and, in a shadowy world of half-truths and old enmities, ties herself to him without fully understanding the ancient line they are crossing.